Like I said, I have another DIY for you all. I've been wanting to try something like this for a while, which is why I am so excited with how it turned out. Plus it was extremely simple! Which is always a good thing, let's just say I didn't get my art talents from my artist mom. Any who, hope you try this out too, it's quite fun! I found this plain back sweatshirt at Target (in mens clothing) for 5 dollars. 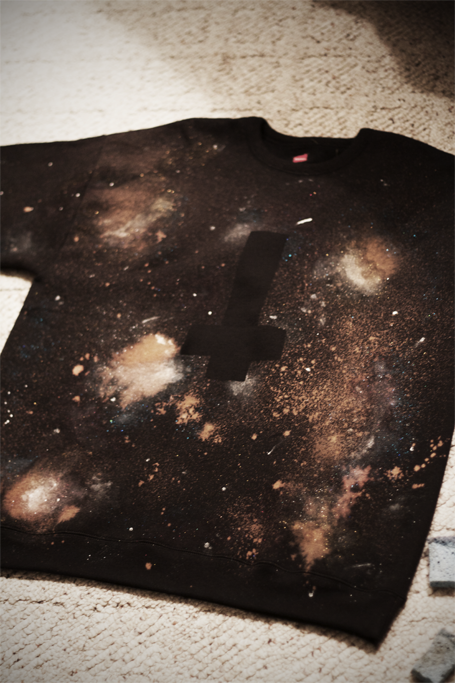 If you don't want to make your galaxy on a sweatshirt you can do it on any other article of clothing just as long as it is black. Take your duct take and make it in the shape of a cross, for mine I decided an inverted cross would look pretty lovely. The tape doesn't stick very well so just make sure the edges are pushed down before you begin spraying. This step should probably be done outside since bleach can be hazardous to your health in an enclosed space. Also bleach ruins clothes, so make sure you aren't wearing your favorite outfit just in case any spills! Take your spray bottle and mix in 70% water and 30% bleach. It's okay to just estimate this amount. 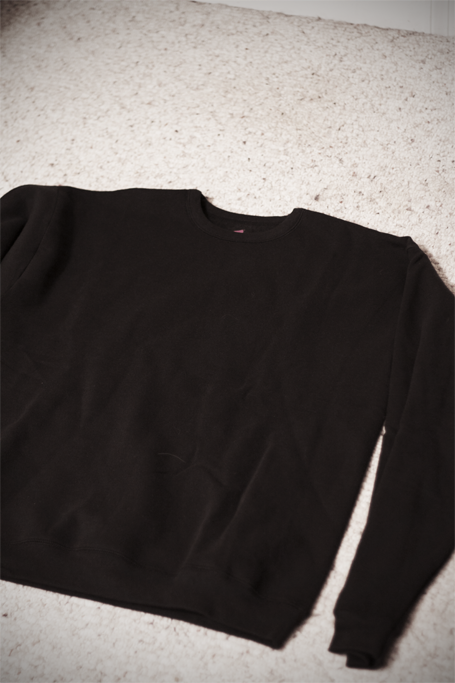 Spray mixture over your sweatshirt, making sure to spray some spots more than others. It should start to look something like this about 2-3 minutes later. For variety, I took out the top of the spray bottle and dripped larger drops over the surface of the sweatshirt. You can see how I added more bleach to a few spots and left others with just a light amount. 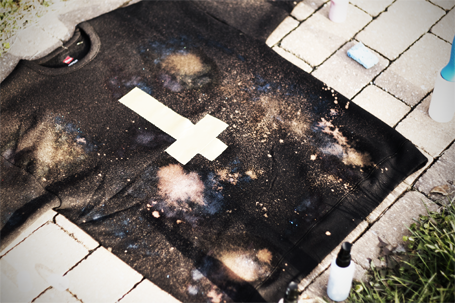 Allow bleach to fully dry, about an hour, before beginning to paint. To speed up drying you can use a hair dryer over wet spots. Luckily at my craft store they had sparkly spray fabric paint, if you can find this stuff, it really adds a nice touch to your galaxy. However, using regular acrylic paints will work too! 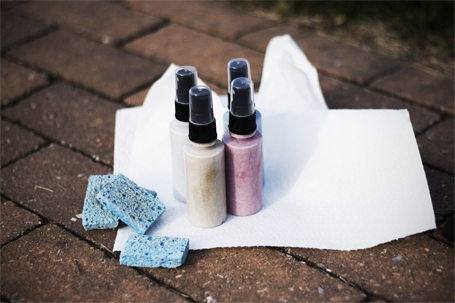 Take your sponge and cut it into four sections, one for each color, and begin to spray in and around the bleach. Once on the fabric use the sponge to help blend in color. The picture above is about 15 minutes in. You can see how I am just spraying blue and pink around the edges of the larger bleach spots and the lighter colors towards the middle. Honestly, this is totally random so just have fun! Plus there is no way you can mess up! Wait for the paint dry and then do the same on the back. Once the color is to your satisfaction take the plain white paint and dabble around bleach spots, blending with sponge. I also added a few white dots, unblended, in random patterns. A few shooting stars were the final touch. Once painting is done, carefully remove duct tape. 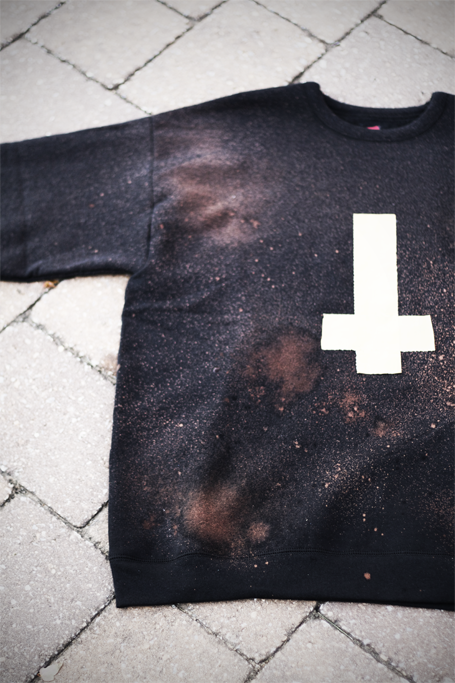 Allow paint to dry for 72 hour before you throw it in the wash. 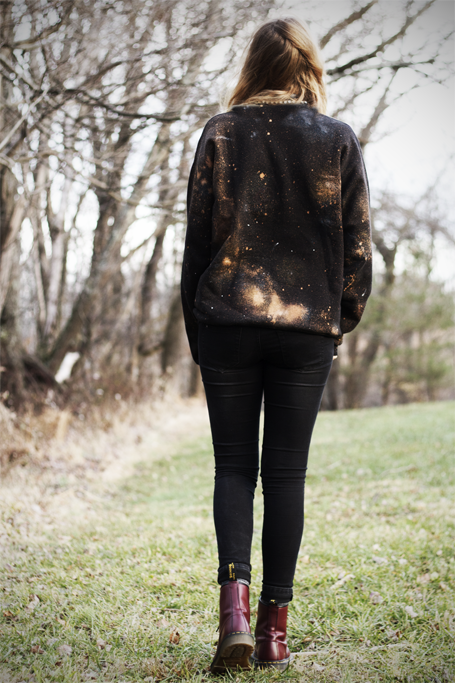 Finally, head out with your brand new sweatshirt and make everyone jealous of your lovely sparkly galaxy print! Pair it with classic Dr. Martens and a pair of skinny jeans. Let me know if you have any questions. If you decide to give it a go, send me the link to your finish product, I'd love to check it out! wow, this looks so cool! 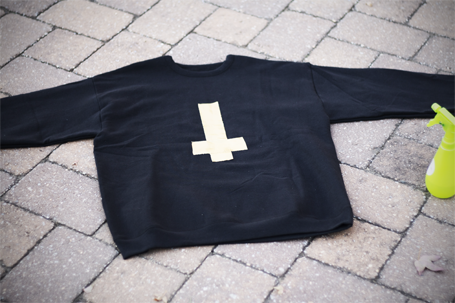 I've never been a fan of the cross trend, but I definitely want to try this, maybe without the cross or with some other shape. awesome tutorial! I definitely want to give this a go sometime. Wow, love how this turned out! Looks pretty simple and fun too. Woooow! so simple & beautiful! so lovely! It turned out great. Lovely pictures. You can see my latest bleach using project on my blog below. This is amazing. I want to try it now! This looks great! 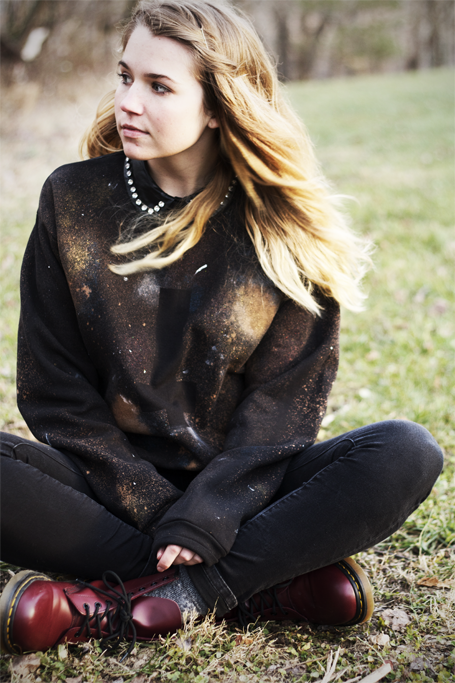 And who doesn't have an old faded hoodie around just waiting for a cool update like this. Thanks for the inspiration.